The bottom line: Hollywood done good. Now playing in theaters everywhere is The Town, a love story/crime movie hybrid that confirms the filmmaking promise Ben Affleck showed with Gone, Baby, Gone, his auspicious directorial début from 2007. Also now playing everywhere is The Social Network, David Fincher’s second major masterpiece in the past four years (along with Zodiac in 2007), confirming the director as a uniquely American visionary in the midst of an astonishing mature period. Each film is crucial viewing for lovers of American cinema, as they both illustrate what Hollywood still knows how to do right, albeit in very different ways and to different degrees. Ben Affleck is an interesting case – a talented actor who nearly self-sabotaged his career by starring in a long string of crappy action movies around the turn of the millenium. Then, in 2006, he poignantly played George Reeves, television’s original Superman, in the massively underrated Hollywoodland. It must have hit awfully close to home for the former Daredevil star to play Reeves as a washed-up has-been in tights begging to be taken seriously by the industry. Whatever the case, the delightful performance, a supporting role by any measure, earned Affleck the Best Actor award at the prestigious Venice Film Festival and set the stage for the actor’s reinvention. This notion was confirmed the following year with the release of Gone, Baby, Gone, a dark, brooding crime film indebted to the recent work of Clint Eastwood, which Affleck co-wrote and directed but did not star in. Gone, Baby, Gone had its share of plot contrivances but the narrative twists and turns led to a very welcome and satisfying finale; after returning a young kidnapping victim to her rightful but drug-addicted mother, Casey Affleck’s private detective character realizes the kid is in an even worse place than before. For me, the unexpected gravitas of this ironic “happy ending” and the moral questions it raised lingered long after the closing titles. If there’s nothing in The Town quite as good as that, no matter. Affleck takes a serviceable Chuck Hogan cops and robbers plot and injects it with enough genuine human emotion, juicy performances and authentic sense of place to put most recent Hollywood fare to shame. Affleck directs himself this time as Doug MacRay, a Boston-bred career criminal who pulls off a bank job in the film’s opening scene, one that requires him to take as hostage the bank’s manager, Claire Keesey (the always reliable Rebecca Hall). Because MacRay and his cohorts are wearing masks, Claire doesn’t recognize him when she and Macray meet cute in a laundromat several days later. The budding relationship between the two, which provides MacRay with a glimpse into a way out of “the life,” gives the movie its heart. Unlike the cardboard cutouts populating most contemporary Hollywood action movies, here at last are two people we can care about. As an actor, Affleck has never been better as MacRay, a blue-collar hood whose tough exterior masks a sensitive soul, but even he’s upstaged by Jeremy Renner as violent sidekick Jim Coughlin. 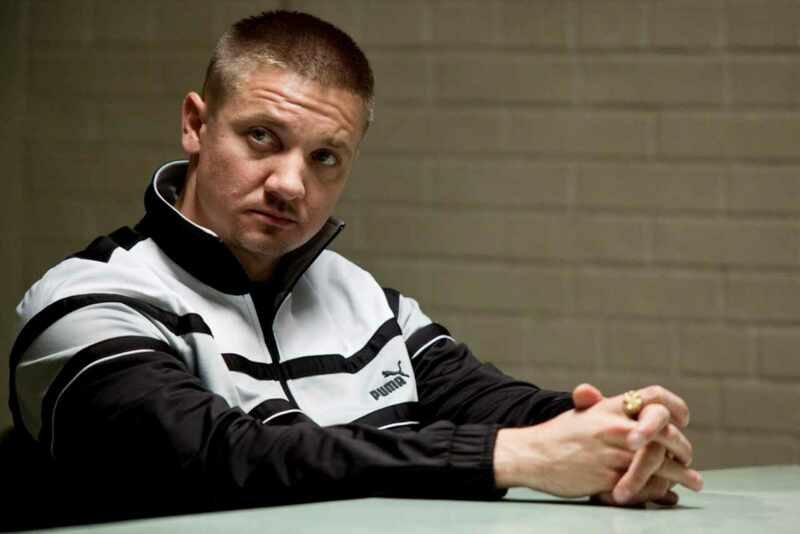 Renner, so memorable as the cocky, adrenaline-junky Sergeant in The Hurt Locker, carves out a different but equally impressive character here. Coughlin unpredictably vacillates between quietly charismatic and live wire manic; with his heavy eyelids and thuggish charm, Renner resembles no one so much as Jimmy Cagney in his prime. The rest of the ensemble cast, including Pete Postlethwaite, Chris Cooper, Jon Hamm and Blake Lively, is fine too; Affleck as director gets a lot of mileage out of these actors in the film’s quieter moments, especially in shots where they simply listen and react to each other, moments that a lot of other narrative filmmakers couldn’t be bothered with. Less successful is the mechanical way the plot grinds to a One Last Job climax, preceded by several scenes in which MacRay finds that his criminal brothers want to Keep Pulling Him Back In. But even these aspects seem to reflect the influence of Eastwood, an old hand at balancing human drama with the demands of commercial genre filmmaking. Towards the end of the film, Jon Hamm delivers the jokey throwaway line “It’s for you,” a direct crib from The Good, the Bad and the Ugly, but the film’s most important antecedents would appear to be minor Eastwoods like The Gauntlet and Blood Work, crime thrillers with more invested in their unlikely love stories than in any action set pieces. In the end, The Town is intelligent, modest, well-acted, emotionally moving and all around well-crafted. These are virtues that used to be a dime a dozen in Hollywood genre films of the 1940s and 1950s. Today, they’re so rare that to see them combined in one movie is almost enough to make you weep with gratitude. When was the last time you saw a 21st century American film that felt like it could have only been made in the here and now? As much as I love The Assassination of Jesse James by the Coward Robert Ford, Mulholland Drive, There Will Be Blood, The Hurt Locker, Before Sunset and even David Fincher’s own Zodiac, I’m not sure if any of those films couldn’t have been made elsewhere or in a previous era. The Social Network, by contrast, is so new and so prescient, it feels almost like a bulletin from the future. It tells the by-now familiar story of Mark Zuckerberg, the teenage wunderkind who founded Facebook from his Harvard dorm room and became the youngest billionaire in history. The fact that Zuckerberg’s life has been dramatized in a movie when the subject is still only 26 years old, is also, for better or for worse, emblematic of the times. 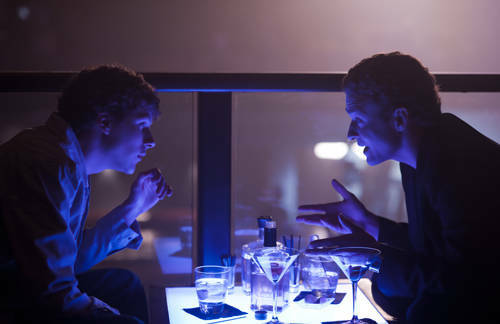 The Social Network uses dark, lush digital images (the kind that only Fincher seems able to capture), wall-to-wall dialogue, hyperkinetic editing and a discordant techno score to paint a portrait of America in the internet age that’s as frightening as it is beautiful. Like Zodiac, it confronts the viewer with an endless, raging sea of information, which by design cannot possibly be processed in a single viewing. Much of this information comes verbatim from legal depositions given as Facebook skyrocketed in popularity and lawsuits were filed against Zuckerberg by former friends claiming he had either stolen the idea from them or swindled them out of stock shares. The deposition scenes take place in the present and serve as catalysts for a series of flashbacks that may represent objective reality or may be scenes colored by subjective memory. The film’s greatness lies largely in its ambivalence towards Zuckerberg; we can never be entirely sure to what extent he might be a visionary genius and to what extent he may have opportunistically screwed over his friends. Or does the truth lie somewhere in between? The only thing we know for sure is that Zuckerberg’s grandiose ambitions were fueled mainly by his own social insecurity, a point driven home in the film’s final chilling scene. The screenplay for The Social Network was written by the esteemed Aaron Sorkin and serves up delicious machine-gun paced dialogue for the film’s entire 2 hour running time. 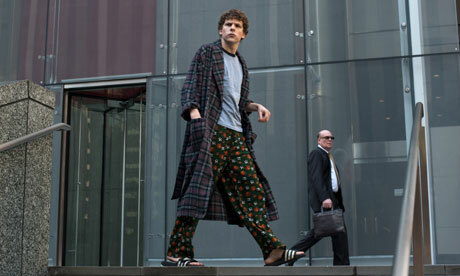 It helps that Jesse Eisenberg plays Zuckerberg. (Since playing the precocious teenage lead in The Squid and the Whale, Eisenberg has graduated to specializing in playing neurotic, motor-mouthed adults.) The film’s best scenes involve rapidly edited battles of meticulously phrased, rat-a-tat line delivery, especially the ones involving Justin Timberlake as Napster co-founder Sean Parker. Timberlake, a terrible musician, is absolutely riveting as the Satanically charming Parker, so much so that you may find yourself hoping he returns every time a scene involving him ends. According to the movie, Parker was broke financially in the wake of Napster lawsuits and yet somehow finagled his way into becoming a substantial Facebook stockholder after intellectually seducing and “informally advising” Zuckerberg. The movie’s key scene between the two of them is one for the ages: set in a garishly lit nightclub, Parker comes on like Mephistopheles while Dennis De Laat’s “Sound of Violence” reaches pulse-pounding levels on the soundtrack. The question arises: are these character portrayals accurate? My answer is who cares? If you want non-fiction, watch a documentary. Historical authenticity is not inherently valuable. What Sorkin and Fincher capture are larger truths about the world we live in, such as the disturbing fact that privacy, as Parker happily admits, is the relic of a bygone era. This entry was posted on Sunday, October 3rd, 2010 at 2:07 pm	and tagged with Ben Affleck, David Fincher, The Social Network, The Town and posted in Film Reviews. You can follow any responses to this entry through the RSS 2.0 feed. Can’t beat Sorkin for rapid-fire dialogue! Great post. I wanted to see both of these movies, but your article made me want to see them TODAY. Absolutely agree with your perspective on Affleck. I think he’s going to be a great director. Adam, I was unfamiliar with Sorkin before this but his script is phenomenal. I’d say he’s the front-runner for the Best Adapted Screenplay Oscar. Suzi, I’d be shocked if you didn’t really like both movies. And while I absolutely share your enthusiasm for Affleck as a director, I have to admit to being a little disturbed that his name is bigger than Alfred Hitchcock’s in my “tag cloud”!